"...The Virgin's name was Mary. Upon arriving, the angel said to her, 'Rejoice, O highly favored daughter! The Lord is with you. Blessed are you among women.' She was deeply troubled by his words, and wondered what his greeting meant. The angel went on to say to her: 'Do not fear, Mary. You have found favor with God. You shall conceive and bear a son and give him the name Jesus...'"
Every century and culture has interpreted Mary in different ways. You could almost drown in the various ways that the Christian tradition has honored Mary! Consider the paintings, sculptures, icons, music, liturgies, feasts, spiritual writings, theologies, and official doctrines. George Tavard wrote a book recently, and his title gets it exactly right: The Thousand Faces of the Virgin Mary. It seems that the image of Mary has allowed the Christian imagination to think very creatively and very differently about understanding Mary. But now it's our turn, we the generation alive today. How should we consider Mary (or Miriam, as she would be known in Hebrew) in the 21st century? We know very little about Miriam of Nazareth as an actual historical person. In this she is in solidarity with the multitudes of women through the centuries, especially poor women and poor men, whose lives are considered not worth recording. We must also be respectful of her historical difference from us in time and place. She is a first-century Jewish woman; she is not a 21st-century American. And that difference must be respected. The four Gospels portray her in very different ways, reflecting their very different theologies. At first glance, Mark comes across as having a negative view of Jesus' mother. She arrives with other members of the family as Jesus is preaching and they call to him. When the crowd tells Jesus his mother is asking for him, he replies, "Who is my mother and brother and sister? Those who do the will of my father are mother and brother and sister to me" (see Mark 3:31-35). And Mary remains outside. Mark does not seem to have a positive view, at that point, of Mary as a disciple. Matthew's view of Mary is rather neutral by comparison. He places her in the genealogy of the Messiah, in line with four other women who act outside the patriarchal marriage structure, thereby becoming unexpectedly God's partners in a promise-and-fulfillment schema. In Matthew's Gospel, though, Mary doesn't speak, and all the focus on the birth story is around Joseph. Luke describes Mary as a woman of faith, overshadowed by the Spirit at Jesus' conception and at the beginning of the Church at Pentecost. She is the first to respond to the glad tidings to hear the word of God and keep it. This is a pictorial example of Luke's theology of discipleship. It's a very positive view of Mary from which we have mostly gotten our tradition. Finally, John has a highly stylized portrayal of the mother of Jesus, and that's all he ever calls her. He never names her. She is pierced twice in John's Gospel, at the beginning and at the end, at Cana and at the cross. And again she is there embodying responsive discipleship to the word made flesh. As with the Gospel portraits of Jesus, these diverse interpretations cannot always be harmonized. But each is instructive in its own way. To glimpse the actual woman behind these texts is difficult. Now we get help from new studies of the political, economic, social and cultural fabric of first-century Palestine. New studies are enabling us to fill in her life in broad strokes. Much of this knowledge of the circumstances in which she lived has resulted from the contemporary quest for the historical Jesus. But it serves us as well for a quest for the historical Mary. So let's go questing for Miriam of Nazareth—as a Jewish village woman of faith. As a member of the people of Israel, Mary inherited the Jewish faith in one living God, stemming from Abraham and Sarah onwards. She prays to a God who hears the cry of the poor, frees the enslaved Hebrews and brings them into their covenant relationship. Given Jesus' clear knowledge and practice of the Jewish faith in his adult life, as reflected in the Gospels, it is reasonable to assume that Mary, with her husband, Joseph, practiced this Jewish religion in their home, following Torah, observing Sabbath and the festivals, reciting prayers, lighting candles and going to synagogue, according to the custom in Galilee. Later at the end of Jesus' life, Luke depicts Mary in her older years as a member of the early Jerusalem community, praying with 100 other women and men in the upper room before the coming of the Spirit at Pentecost. What we see from this—and most scholars think that that's a historical glimpse—is that Mary participated in the early Christian community in Jerusalem. Now in the light of the death and resurrection of Jesus, this gathering of disciples believed that the Messiah had come. But in no way did they think that this was a cause to leave their religion; they kept going to the Temple, and so forth. For many years, they preached the good news to their fellow Jews trying to get them to understand the promise of God has been fulfilled, before finally being persuaded by Paul and others that the gospel was meant for gentiles too. To use a term coined in scholarship, Mary was a Jewish Christian—the earliest kind of Christian there was. This was before Christianity split off from the synagogue. She was never a Roman Christian, never a gentile at all. So it does no honor to her memory to bleach her of her Jewishness. We've done this ethnically by turning her swarthy Jewish complexion into fair skin and blonde hair and blue eyes. But we've also done this religiously by turning her deeply rooted Jewish piety into that of a latter-day Catholic. She wasn't. Mary lived in a Mediterranean rural village, Nazareth, whose population consisted largely of peasants working the land and craftsmen who served their basic needs. Married to the local carpenter, she took care of the household. Now how many children were in that household? Well, her firstborn son, Jesus, obviously lived there, but we also read in Mark's Gospel that the mother and the brothers and the sisters lived together in Nazareth. And these brothers are named in Chapter Six: James, Joses, Judas and Simon. His sisters Mark leaves unnamed, as typically happened with groups of women in the New Testament. The apocryphal gospels explain that these are Joseph's children by previous marriage. But however many were in the household, we would know that in her setting, her days would ordinarily be taken up with the hard, unrecompensed work of women of all ages: to feed and clothe and nurture her growing household. Like other village women of her day, she was probably unlettered, illiterate. The economic status of this family is a matter of some dispute. Scholars like John Meier place them in a blue-collar working-class arrangement, while others such as John Dominic Crossan assign them to the peasant class, desperately struggling under the triple taxation of Temple, Herod and Rome. Either way the times were tough. This village was part of an occupied state under the heel of imperial Rome. Revolution was in the air. The atmosphere was tense. Violence and poverty prevailed. We owe a debt to Third-World women theologians who have noticed the similarities between Mary's life and the lives of so many poor women, even today. Notice how the journey to Bethlehem in order to be counted for a census accords with the displacement of so many poor people today separated from their ancestral homes because of debt and taxation. Notice how the flight into Egypt parallels the flight of refugees in our day—women and men running with their children to escape being killed by unjust military force. Notice how Mary's experience of losing her son to death by unjust state execution compares with so many women who have had their children and grandchildren disappear or be murdered by dictatorial regimes. Mary is a sister, a compañera, to the suffering lives of marginalized women in oppressive situations. It does Mary no honor to rip her out of her conflictual, dangerous historical circumstances and transform her into an icon of a peaceful middle-class life dressed in a royal blue robe. Mary walked by faith, not by sight. As one theologian once said, "She did not have the dogma of the Immaculate Conception framed and hanging on her kitchen wall." Scripture tells us she asked questions. She pondered things in her heart. And she went on faithfully believing even when grief stabbed her to the heart. She had a relationship with God that was profound. Now in those days, people's hope for the coming of the Messiah included the hope that he would liberate the suffering poor from oppressive rule. Luke's infancy narrative gives a particular twist to our memory of Mary's faith by placing her in a key position of partnership with God to bring about this historic occurrence. The Annunciation scene, as biblically analyzed today, depicts her being called to the vocation of being God's partner in the work of redemption on the model of the call to Moses at the burning bush. It's a prophetic call, a call of vocation to be a partner with God in this great work. Mary gives her free assent, thus launching her life on an adventure whose outcome she does not know. She walks by faith, not by sight. Indeed her very pregnancy takes place through the power of the Spirit. Mary's virginity has been used to disparage women who are sexually active, as if they aren't as perfect as Mary the virgin. But again this event actually sounds a powerful theme for women. Sojourner Truth, the 19th-century freed slave, was speaking once in a hall where a group of black-clad clerics were arguing that she should not even have the right to be on the stage. She noticed their mumbling and said to them, "Where your Christ come from, honey? Where your Christ come from? He come from God and a woman. Man had nothin' to do with it." Business as usual, including patriarchal marriages, is superseded. And God stands with the young woman pregnant outside of wedlock, in danger of her own life. God stands with her to begin fulfilling the divine promise. Now Mary's faith-filled partnership with God in the work of liberation is sung out in Luke's Gospel in her magnificent prayer, the Magnificat (Lk 1:46-55). It's the longest set of words placed on the lips of any woman in the New Testament. Oddly enough, it is a prayer omitted from most traditional Mariology. Here's the scene: Mary is newly pregnant; Elizabeth her cousin, an older woman, is six months pregnant; Zechariah, Elizabeth's husband, has been struck dumb for his lack of faith; and so there's no male voice to inject itself into this scene. The house is quiet of men. Mary arrives. Elizabeth, filled with the Spirit, embraces her and sings out, "Blessed art thou among women." And also filled with the Spirit, Mary breaks into a new prophetic language of faith. She sings a song in the pattern of Miriam, Deborah, Huldah and Hannah, other great hymn-singers in the Old Testament, and she launches into divine praise. Her spirit greatly rejoices in God her savior. Though Mary is poor and lowly, and a culturally insignificant woman, the powerful living holy God is doing great things to her. And God does this not only to her but to all the poor: bringing down the mighty from their thrones; exalting the lowly; filling the hungry with good things and sending the unrepentant rich away empty. And all of this is happening in fulfillment of the ancient promise—and in her very being. For she embodies the nobodies of this world, on whom God is lavishing rescue. In this song she sings of the future too, when finally, peaceful justice will take root in the land among all people. This is a great prayer; it is a revolutionary song of salvation. As writer Bill Cleary once commented, "It reveals that Mary was not only full of grace but full of political opinions." Miriam's song has political implications—socially radical ones at that. With a mother like this, it's no wonder that Jesus' first words in Luke proclaim that he has come to free the captives and bring good news to the poor. The apple doesn't fall far from the tree! So Mary lived in solidarity with the project of the coming Reign of God, whose intent was to heal, redeem and liberate. It does no honor to reduce her faith to a privatized piety. Worse yet, which sometimes happens in traditional Mariology, is to reduce her faith to a doting mother-son relationship. She hears the word of God and keeps it. What I'm suggesting is that before Jesus was born she had her own relationship to God that wasn't focused on Jesus. Even after his death and resurrection, when she is now part of the community proclaiming him as the Messiah, her pattern of faith is still that of Jewish hope: God's Messiah who now has come will come again soon and bring this justice to the land as a whole. She hears the word of God and keeps it. 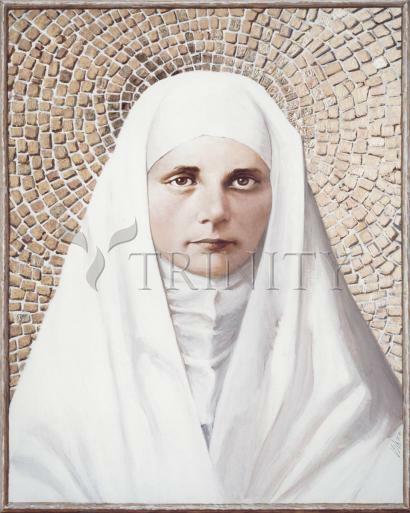 And in this too she is, as Paul VI called her in Marialis Cultus, our sister in faith. We can begin to see the potential in other Gospel scenes. As we remember her and keep foremost the idea that she is a Jewish peasant woman of faith, then we can interpret the other scenes in the Gospels where Mary shows up and where we are presented with the dangerous memory of this very inconsequential woman in her own culture and historical context. With a heart full of love for God and for her neighbor, Mary of Nazareth gives us this tremendous example of walking by faith through a difficult life. We began by asking, what would be a theologically sound, spiritually empowering and ethically challenging view of Mary, mother of Jesus Christ, for the 21st century? My answer has been to suggest that we remember Mary as a friend of God and prophet in the communion of saints. Let her dangerous memory inspire and encourage our own witness. We ought to relate to Miriam of Nazareth as a partner in hope, in the company of all the holy women and men who have gone before us. This can help us reclaim the power of her memory for the flourishing of women, for the poor and all suffering people. It can help us to draw on the energy of her example for a deeper relationship with the living God and stronger care for the world. When the Christian community does Marian theology this way, our eyes are opened to sacred visions for a different future. We become empowered to be voices of hope in this difficult world. Like Mary, we will be rejoicing in God our savior and announcing the justice that is to come. —Excerpts from “In Search of the Real Mary” by Elizabeth Johnson, C.S.J.